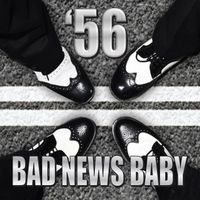 56 makes American Rock and Roll music with style. Their new release, "Steppin", has a mix of original tunes and cover songs that honor the roots of rock music. Hailing from Arizona, they pride themselves on a high-energy live show that's been burning up the club and concert hall circuit throughout the Southwest. Bret Kaiser's powerful vocals make the girls swoon and the fellas want to run out and race with their buddies for pinks; Tom Mein mixes Setzer, Gatton and Les Paul influences with his own style to make his Gretsch White Falcon twang and growl; Austin Case’s wing-tipped acrobatics on the stand-up bass have to be seen to be believed; Jeff "Big G" Garten lays down that swingin beat like no other. If you get a chance to see this group live, do it! They ROCK. Their first single from the album, "Bad News Baby", has received rave reviews and has been burning up audiences wherever they perform. Its a hard-rockin' tale of a down-on-his luck rocker who lives life by the motto "Live Fast, Die Young , Stay Pretty - and make sure they remember your name." A great intro to a rockin band that is sure to be around a while. '56 ROCKS without a doubt! My wife and I went to our first '56 show in Arizona a couple summers back. Since then, we've made a point to see Brett and the guys at a few different venues. Their energy in person is unparalleled. It really is a Rockabilly good time! Whether is it Elvis, Johnny Cash, or something original, '56 always delivers and they do so with style. You can find them on Facebook or check out their fan site at 56rocks.com! I've been a fan for a long time and will continue to be one for a long time to come!